ONCHAN, Isle of Man – January 30, 2018 – The all new FRESH (France Espania Hold'em) Series is set to unite players from France and Spain on PokerStars. FRESH will become the richest ever PokerStars online series in France and Spain with €5 million guaranteed across 50 scheduled events, including a €1 million guaranteed Main Event prize pool and a Platinum Pass package to the PokerStars Players No Limit Hold'em Championship (PSPC) for the Main Event winner. 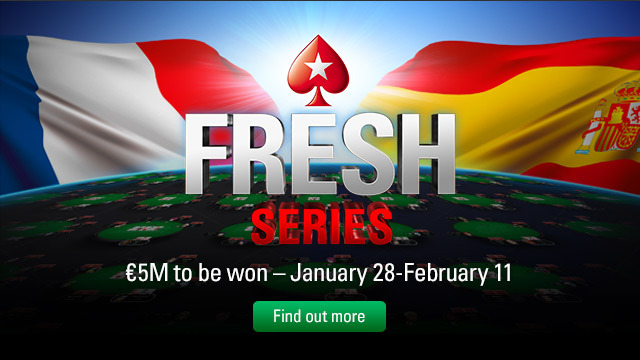 The series takes place January 28 – February 11, with depositor freerolls, special Spin & Go FRESH Main Event qualifiers, Second Chance Freerolls and even opportunities to qualify for free, which are available in the PokerStars lobby now. The FRESH Series will celebrate the coming together of French and Spanish tables at PokerStars, which is the first operator approved to offer shared liquidity between the two locally licensed online poker markets. The shared player pool offers players larger guarantees, more games and reduced waiting times. PokerStars players now also enjoy a revamped tournament offering with new daily tournaments featuring guarantees of up to €20,000 and larger Sunday tournaments.